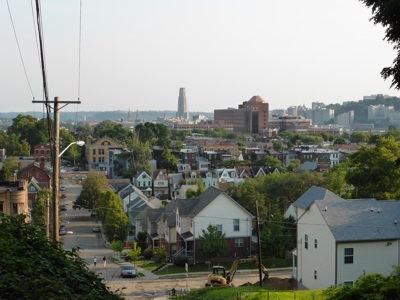 Pittsburgh is the 2nd most populous city in the Commonwealth of Pennsylvania the USA. As of 2006, the city had an estimated population of 312,819, and lay within a metropolitan area with an estimated population of 2,370,776. The city of Pittsburgh is built around the area where the Allegheny and Monongahela rivers merge to form the Ohio river, the downtown area actually lying within the triangular regionin the region bounded by the Allegheny and Monongahela rivers. As a result of this geography, many bridges have been constructed - 446 at last count! It is because of this that Pittsburgh is sometimes known as "The City of Bridges" or "The Bridge Capital" of the US.